Long ago, in the 1730's, Charles Hyett built a substantial Georgian country home, now known as Painswick House. He suffered from asthma, and chose the location for the benefits of the hill air. He died 3 years after the house was completed, and the property passed to his son, Benjamin. In the 1740's, he transformed a hidden coombe behind the House into a flamboyant pleasure garden. In 1748, local artist Thomas Robins captured the design on canvas. By the early 1800's, this original design had been lost as the gardens were changed to a more practical layout to grow more fruits and vegetables. Over the next 150 years, whilst this central area was well maintained, the rest of the garden fell into disrepair. Lord Dickinson inherited the property in the 1950's. Unable to afford the upkeep, he abandoned the remaining part of the garden and planted a wood throughout. Before long its was an untamed jungle. The Gardens created by his ancestor seemed lost forever. Following an exhibition of Thomas Robins' paintings in 1976, there was a resurgence of interest in the gardens of the early 18th century. Restoration began in 1984 when the historic importance of the Garden became apparent. It was the sole, complete survivor from the brief Rococo period of English garden design (1720-1760). Restoration began with private funding. 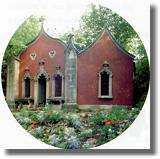 However, in 1988, control of the garden was handed over to the Painswick Rococo Garden Trust, a charity established to ensure the work would be completed and that the Garden would remain open to the public. The six-acre garden is now nearly restored and only close examination of the painting will show those areas still to be completed. You are free to stroll in any direction along the winding garden paths, exploring the garden's features. The garden combines the formality of long vistas and geometric patterns with informal paths, off-centred design and a number of fascinating architectural building designs. The tranquillity of the garden is extended with woodland walks through naturalised wild flowers. One of the most spectacular features of the garden occurs in early spring when snowdrops carpet the woodland floor. Now a fragrant tunnel arbour, old-fashioned herbaceous borders, ponds, contemporary buildings and a large kitchen garden all combine to make a visit to Painswick an enchanting, unforgettable experience. As a celebration marking the 250th Anniversary of the Thomas Robins painting, we have added an unusual maze, which depicts the number 250. This was only planted in Autumn 1998. The Children's Nature Trail runs through a small area of grassland and young woodland. Children can follow the marked trail using a beautifully drawn leaflet exploring the types of wildlife and flora that are visible. The Coach House Restaurant - (open Wednesdays to Sundays only) The licensed restaurant is situated in the old Coach House. We serve Coffee, Teas, delicious home-made cakes, and light lunches. When in season, we try use our own produce from the kitchen garden. The Present Collection Shop - A gift shop which offers a wide variety of gifts for all ages and pockets. Pan Global Plants - Truly, the place for the discerning plant lover seeking something a bit different. This nursery offers an unusual range of trees, shrubs, and herbaceous borders from all over the globe. The restaurant shop and toilets are all accessible to wheelchairs. However access to parts of the garden is difficult, we would advise you to telephone and ask about the possibilities. Picnic area for visitors to the garden. Dogs on leads are welcome in the garden. Painswick is situated on the A46 between Cheltenham and Stroud. We are on the B4073, half a mile from the centre of Painswick (Follow the brown tourist information signs). Public transport : Train service to Stroud and Cheltenham. Bus service running from Bath, Stroud and Cheltenham to Painswick.